The solid pilot is a detail accurate for a later service life appearance for this 4-8-4 Northern-type steam locomotive. Sunset Models’ HO-scale brass replica includes working Mars light, located above the headlight on the boiler face. 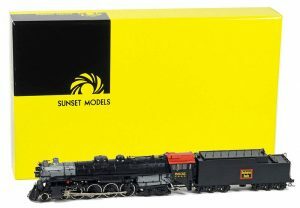 Sunset Models recently imported a limited group of Chicago, Burlington & Quincy (CB&Q) steam locomotives with brass construction and bronze and steel gearing. 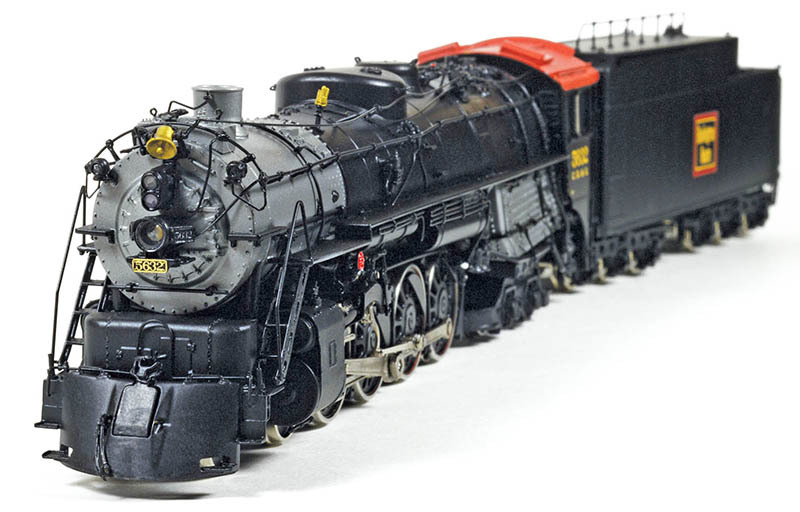 Part of the company’s Legends collection of HO releases, this CB&Q replica reproduces the road’s Class O-5 Northern-type 4-8-4 steam locomotive. The CB&Q’s Class O-5 prototypes first saw production in the 1930s. The locomotives saw use in heavy-duty, high-speed freight service. 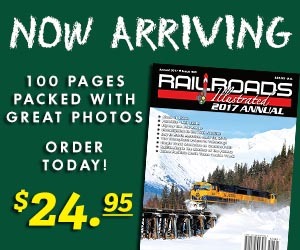 The first examples of the 5600-series came from Baldwin Locomotive Works. The late production examples were built by the railroad’s West Burlington, Iowa, shops. For its brass replica, Sunset Models had three road numbers produced: 5614, 5632, and 5632. This places the brass models among the 26 examples of these locomotives built by the CB&Q. The HO-scale CB&Q No. 5614 model features open cab window design. The other two road numbers are Class O-5A and O-5B examples with closed vestibule cab design, solid pilot shroud, and roller bearings. The HO brass replica comes fully assembled and features factory-installed Digital Command Control (DCC) with QSI’s Titan electronics used for its audio reproduction. Two 30mm speakers with plastic enclosures are included in the design for ample audio output ability. Sunset Models’ impressive HO-scale brass CB&Q Class O-5 reproduces one of the most famous examples of steam locomotives to operate on the Burlington Route. The brass import comes fully assembled, and includes working Mars light, Japanese-made Canon motor, sprung drivers, and QSI’s Titan sound with dual 30mm speakers. The drive mechanism includes a Japanese-made Canon motor. For added pulling power, Sunset Models offers a separately sold rubber tire driver assembly (MSRP: $30). The locomotive is recommended for operation around 30-inch radius or wider curves. The tender comes with metal wheels and factory-installed Kadee knuckle coupler. The model includes directional lighting. Under DCC control, the front headlight and Mars lights can be turned on and off; the tender back up light also functions and can be toggled on/off. Showing the oil burning version, the tender on Sunset Models’ Class O-5 replica includes the ability to serve as either a coal burning version or the displayed oil burner. The rectangular upper section of the oil storage appearing on the tender’s roofline (with round hatch that opens and handrails with stanchions running its length) can be removed. Once the oil version section is off, you’ll find the bin and related detail for a coal burning tender. Provided with this release is simulated coal for loading in the tender. The locomotive includes full backhead detail in the cab. Clear glazing material is included in the cab windows to simulate glass panes. The twin cab roof vents can be positioned open or closed. The boiler includes piping, electrical conduit, whistle chord, and many separately applied details, including gold colored pop valves, whistle, and bell. 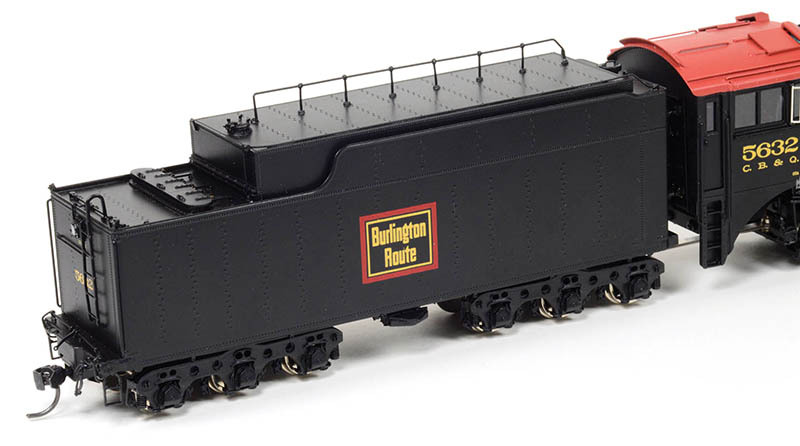 The model is professionally finished in prototypical color with accurate Burlington Route herald on the tender and gold lettering on the cab sides, along with gold rimmed number board below the headlight on the boiler face. This limited production release lists for $1,399.95. Sunset Models sells this release direct, as well as through hobby dealers. The production run totalled 125 examples and only a few remain available as this issue went to press. You can check Sunset Models online for the latest availability information. 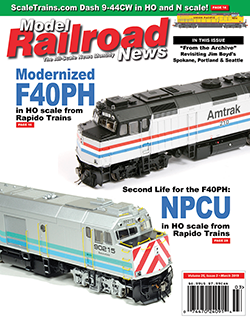 This review appeared in the March 2019 issue of Model Railroad News!